A witness came forward and said just moments before gunfire erupted, Wisner Desmaret robbed someone in his car. “The dude just rushed my car and started fighting on us,” said witness Roderick Nance. Nance said he and his cousin were attacked by Desmaret Saturday evening after Desmaret attempted to take a cell phone from Nance’s car. During the altercation, Nance said he noticed Desmaret drinking a Four Loko and acting disorderly. “Either like he just, he was on some really bad drugs or he wasn’t in his right state of mind,” Nance said. Desmaret then fled on foot across Dr. Martin Luther King Jr. Blvd. toward Flint Drive, according to Nance. Moments later, officer Adam Jobbers-Miller was shot. Nance said all he was trying to do was pump gas at the gas station, and added that’s when Desmaret confronted him and his cousin. Desmaret’s immigration status: Did the system fail? How was Desmaret still on the street and still in the country? As WINK News continues to dig into the suspected shooter’s immigration status and criminal background, those are the questions on a lot of minds Wednesday night. In a community that loves their boys and blue, news that someone in the country illegally is suspected of shooting a police officer is a lot to swallow. “Illegally or not illegally I think he should get what he deserves,” said Naples resident Sally Reisinger. Reisinger was giving blood for Officer Jobbers-Miller. But the immigration system is not the only place that had contact with Desmaret. “This shouldn’t have happened, ” said Matt Sellers, of the Florida Gulf Coast Police Benevolent Association. In Lee County, the state attorney’s office did not prosecute Desmaret on several cases. Some because a judge ruled him incompetent to stand trial, but others because they did not feel there was enough evidence. The law enforcement community is reacting as they pray for officer Jobbers-Miller’s recovery. “I haven’t taken a close look, just what I’ve seen in the news – and at first glance this is a serious problem where the system in many many areas has broken down,” Sellers said. WINK News heard from Rep. Francis Rooney’s office. They’re working to get information released on Desmaret’s immigration history and find out why he’s been able to stay in the country. WINK News reporter Kelsey Kushner spoke with local leaders about the impact this shooting has had on the community. The man accused of shooting officer Jobbers-Miller is recovering in the intensive care unit at Lee Memorial hospital Wednesday. 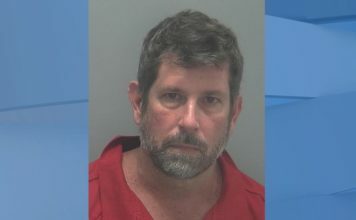 A judge decided to postpone Desmaret’s first appearance until he released from the hospital and booked in the Lee County jail. The state juggled around some ideas such as holding a video conference or taking the first appearance to the hospital but the defense says they worry that those options could have a negative affect on Desmaret’s care. It is unclear at this time when doctors will release him.